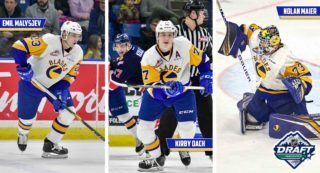 Earlier this week we announced three Albertan Blades prospects who were named to their provincial Under-16 Summer Camp Roster. 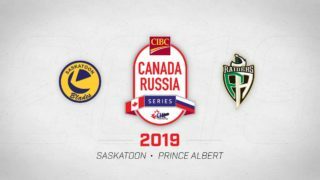 Rounding out the list of Blades prospects named to other provincial U16 camp rosters are three prospects from British Columbia and four from Saskatchewan. Brodie Guenther, who is from Warman, is one of three goaltenders attending Saskatchewan’s U16 summer/fall camp. Guenther was selected 206th overall by Saskatoon in the recent 2018 WHL Bantam Draft. Marek Schneider was the Blades’ second pick in the draft at the 30th overall spot and he is one of twelve defensemen attending the camp. Fellow d-man, Garin Scherr, who drafted with the Blades’ 87th pick also made the list. Both blue-liners bring size to compliment their skill, and both shoot right-handed. Schneider already stands at 6’0″ tall while Scherr was one of the bigger d-men in the 2018 draft class at 6’2″. Homegrown product, Alex Bernauer, will look to crack a roster spot along with 13 other forwards attending the camp. Bernauer was drafted in the 5th round by the Blades after leading his Saskatoon Maniacs squad in goals, points, and penalty minutes. Over in British Columbia, Spencer Shugrue will try to earn an invite to the provincial U16 summer camp. Shugrue put up 12 points and 22 penalty minutes this past season with Delta Academy of the CSSBHL. 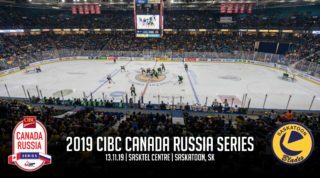 Shugrue is one of 18 blue-liners vying for a spot on the team that will compete in the 2019 Canada Winter Games in Red Deer. Brayden Melnyk is one of six netminders attending. Melnyk had a strong season at Yale Academy where he posted a .907SV%. He was drafted 178th overall by the Blades. Lastly, Sammy May, who was selected 228th, will look to showcase his tenacious style after collecting 21 points and 48 penalty minutes this season with Delta Academy. All three B.C. Blades prospects are split on three different camp teams, so the chemistry building will have to wait at least until Blades training camp. 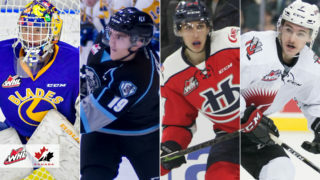 In total, ten of the Blades’ draft picks will be attending summer camps this off-season with hopes of earning a chance to play at the Winter Games. 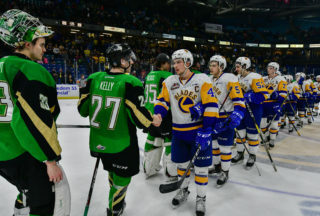 For most, it will also be the last competitive skate before arriving at their first WHL camp in Saskatoon at the end of August.